Designed To Withstand Nature's Extremes. Shingles are the first layer of a home's defense, protecting us against extreme weather that can be dangerous to the people and the things we hold dear. When you choose Atlas shingles with Core4™ Technology, you can be sure that you are sheltering your family beneath some of the most durable shingles in the industry. Two Great Styles - Same Core4™ Protection! Made from advanced polymer materials. Bends and resists breaking and cracking in the cold. Resists impact from hail and high winds. Maintains stability in severe weather conditions. PolyCore™ Technology is what makes shingles with Core4™ stronger and longer-lasting than other leading shingle brands. StormMaster® shingles with Core4™ are made from enhanced virgin polymers, which means the asphalt core is scientifically engineered to perform better with increased consistency and reduced variability. In comparison, shingles containing recycled polymers are made of imperfect materials that can adversely affect the life span of your roof. • Protect and extend the life of your roof. • Perform better than standard asphalt technology. • Better tear strength: Because these shingles bend and flex, they exceed the industry’s standard tear strength requirement by 50 percent – even in cold-weather installations. • Flatter installation: Shingles that don’t lay flat won’t seal properly during installation. FlexCore™ makes them more pliable, which means they lay flatter, seal more effectively, and provide greater protection for your home. StormMaster® Shake shingles with Core4™ Technology come with the highest wind warranty in the industry. Core4™ enhanced polymers, coupled with the Atlas double FASTAC® adhesive sealant line, create a strong, thermally bonded roofing system. 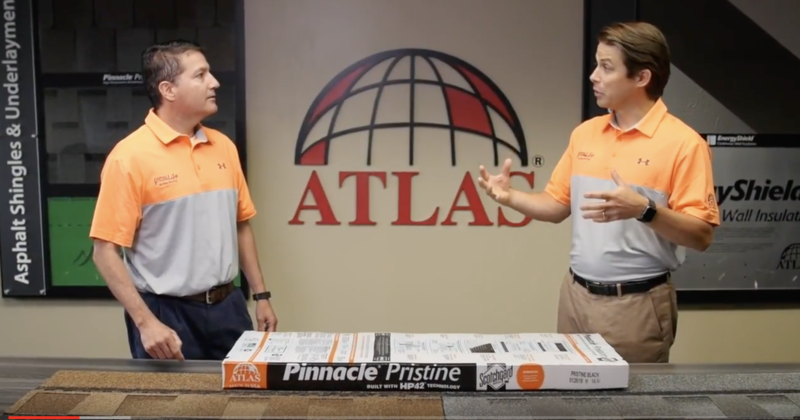 In fastener pull-through tests, which examine the strength of the nail within the Atlas 1 1/2” Sweet Spot™ nailing area, shingles with Core4™ performed more than 50 percent better than standard asphalt shingles. StormMaster® shingles with Core4™ are UL 2218 Class 4 Impact rated. The test consists of simulating the speed and terminal velocity of a 2” hail stone falling from the sky. To meet Class 4 Impact criteria, the shingle must show no evidence of fractures or cracks on the back side. During its lifetime, your roof experiences thermal shock, or wide variations in heat and cold. StormMaster® shingles are built to mitigate the effects of expansion and contraction due to temperature changes. 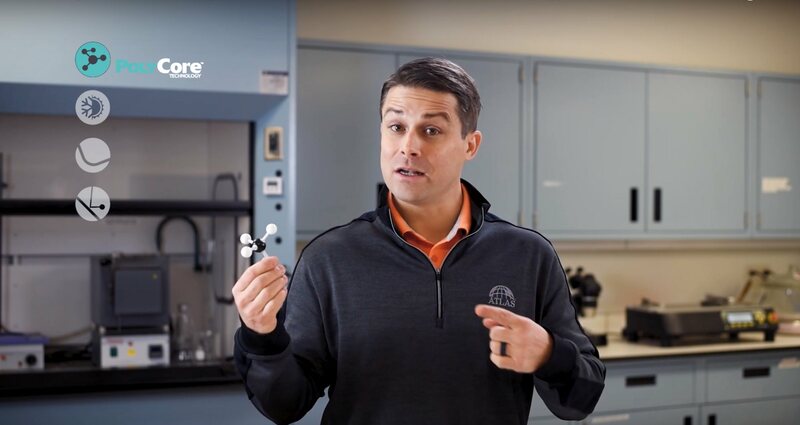 ThermalCore™ Technology also leads to better granule adhesion. Even as the shingles expand and contract, they are less prone to shedding granules. Granule adhesion is important because shingle granules play a critical role in protecting your roof from the elements. Premature granule loss can lead to accelerated aging, asphalt exposure, and roof deterioration. *Refer to the Atlas Roofing Limited Shingle Warranty for all coverage requirements. ↑Helps resist the black streaks caused by algae.